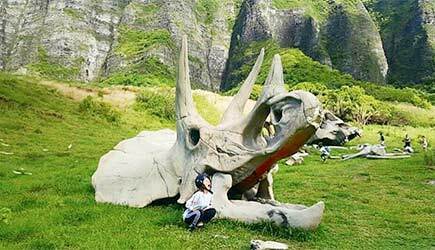 Explore Kualoa’s "Jurassic Valley” with an electric assisted motor mountain bike! The Ultra Package includes the E-Bike AND Kayaking! Select a date to start reservation! Jurassic Park E-Bike Tour is a great way to experience Kualoa Ranch’s most popular landmarks from a unique and eco-friendly vantage point. You will explore the picturesque “Jurassic Valley” with an electric assisted motor mountain bike (with 4 inch wide tires), and your guide will take you on a leisurely 90 minute adventure starting from the Visitor Center and into the valleys. As you awaken your senses with the breathtaking nature of the island, trek off the beaten path for a behind-the-scenes experience of the 4000 acre Private Nature Reserve’s natural beauty. Experience the movie sites from Jurassic Park and Jurassic World, Kong Skull Island, Godzilla, 50 First Dates, LOST, Hawaii Five-0 and more throughout the valley! The state-of-the-art German engineered bikes are equipped with quiet Yamaha engines. If you need a little assistance, these engines give you a helping hand or more of a push! This is a beginner level tour for guests of all types, and is great for those who may not have the confidence or fitness level to go on a more strenuous regular bike tour. These are not noisy mopeds and you do still need to pedal your bike but not as hard. You will experience the “power-on-demand” feature of eBikes. They seamlessly respond to and complement your efforts, adjusting your pedaling speed and power on the fly. Schedule: Daily at 9am or 12:30pm. Duration: 2 hour with 30 minutes of training and safety briefing. 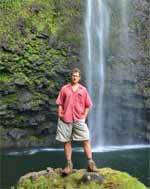 Along with the Jurassic Park E-Bike Tour, this package includes a Kayak tour offshore from Kualoa Ranch. Kayak Adventure will take you downwind all the way from the front of Kualoa out to get close to Mokoli’i Island (Chinaman’s Hat), go over a turtle reef where you may see turtles feeding, over to the mini sandbar where you can get out and walk around. Next, paddle in to Secret Island, fishpond dock, and finally over to the beach fronting the taro farm. Schedule: Monday, Wednesday, Friday and Saturday at 9am. Restrictions: Minimum age is 10 years old. Minimum height is 4 ft. 6 in. and maximum height is 6 ft. 5 in. Minimum weight is 85 pounds and maximum weight is 250 pounds. All riders must know how to ride a bike to do this tour. They will conduct a safety briefing and test ride before each tour. If you are unable to demonstrate that you can ride safely, you will be asked to ride in an alternate vehicle or stay back until the tour is finished (No refund will be offered). What to Bring & Wear: Closed Toe Shoes required. A camera or smartphone, and if it is not waterproof, bring a plastic bag to protect your camera in case of rain. Please bring a change of clothes and a towel if you are doing the Ultra Package. Gear included: Mountain bike with front-suspension, saddle bag storage pack, safety helmet, use of rain gear (optional), and kayak (for Ultra package). Note: Advanced reservations are recommended as many tours sell out 2-3 weeks in advance. Cancellation Policy: Cancellations must be made at least 48 hours before the start of the event. Ultra Package includes E-Bike & Kayak! 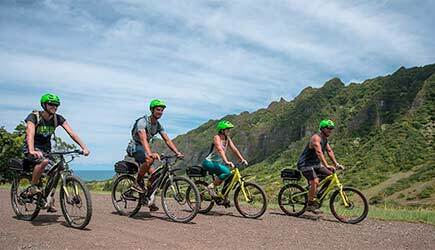 Jurassic Park E-Bike Tour & other Kualoa Ranch events may be available for cruise ship passengers who are in port for the day in Honolulu. 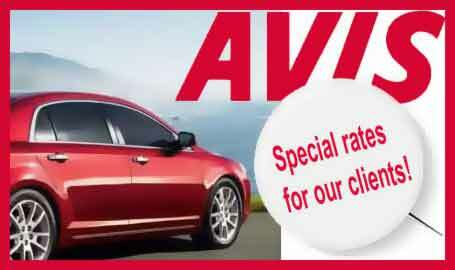 Please call us for details and transportation options. If you’ve never ridden an E-bike you are in for a pleasant surprise! These little wonders of modern technology will put a grin on your face in a hurry! This is nothing like a scooter or moped … there is no throttle to squeeze. You just pedal, and as you pedal you can feel the motor kicking in and assisting you. You can’t just sit there and do nothing; this is still exercise. But it makes biking pleasant and do-able in places that otherwise would just be too much work to be fun. Have you ever been riding a bicycle and all of a sudden you were hit with a gust of wind, and you suddenly lost your desire to continue? That won’t happen with an E-bike. Heading into the wind? No problem. This section of the route is uphill? It feels more like you are peddling on level ground because the motor kicks in when you need it most. E-bikes are pricey … they run around $3k-$5k … but don’t be surprised if you enjoy this so much that you head to an E-bike dealer when you head home from your Hawaii vacation. You really MUST give this a try!!! Kualoa Ranch has some of the most spectacular landscapes in Hawaii … that’s the reason so many Hollywood films and TV shows have shot scenes here. For those utilizing the ranch’s transportation from Waikiki, pickup is between 7am and 8am depending on your hotel. Those driving themselves to the ranch for one of the packages should allow one hour for the drive from Waikiki and arrive no later than 8:30am.